It's her Garden Window Quilt. Isn't it just adorable! 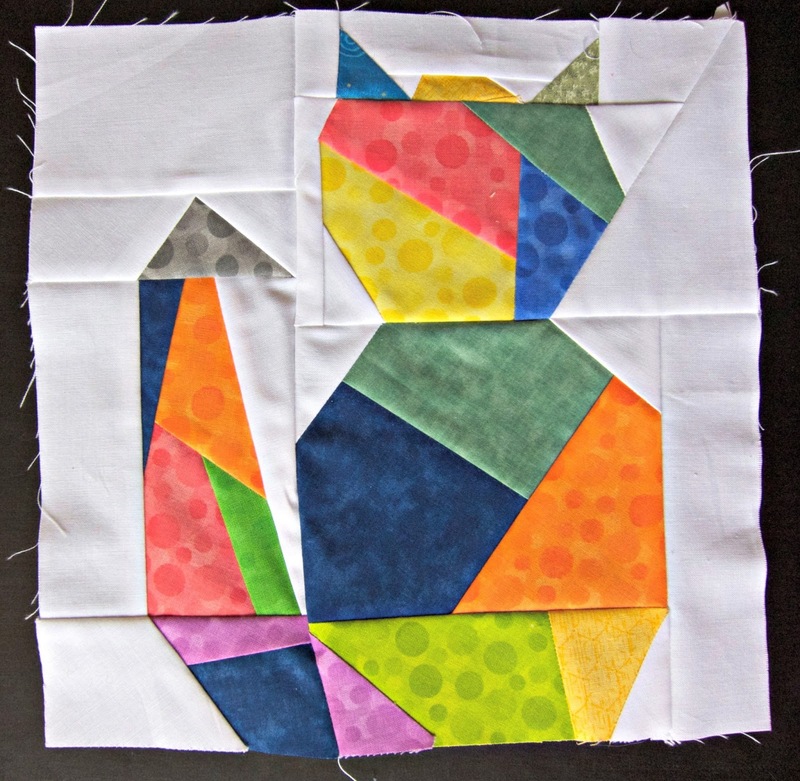 And making strip blocks are so EASY! I love that you can whip some together without have to precisely measure each strip. The moment I saw this I knew I wanted to make one so I've been saving scraps from my various projects and whenever I have a nice sized pile I'll piece together a few blocks. So far I'm up to 25. 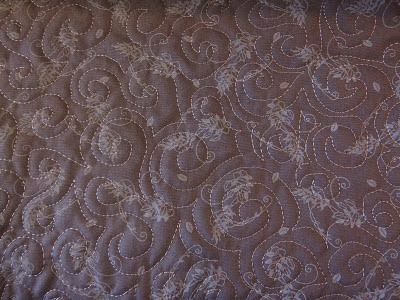 Not sure how big of a quilt I'm going to make yet but I have lots of time to decide that. 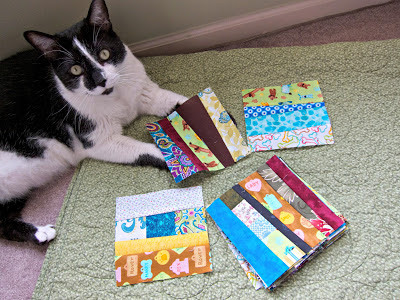 I tried to get a good photo of the blocks this morning but no matter how hard I tried, my furry little buddy Oliver was determined to get in on the act so I just gave up and let him lay there. I've been doing lots of tweaking to my blog to make it prettier and easy to read. Anyone who's been reading my blog for the last few weeks may have noticed ever-changing social media links. I've been playing around with them to see what I liked. I've always thought that the little round buttons with just a small images were very classy but I wasn't sure how to create those. 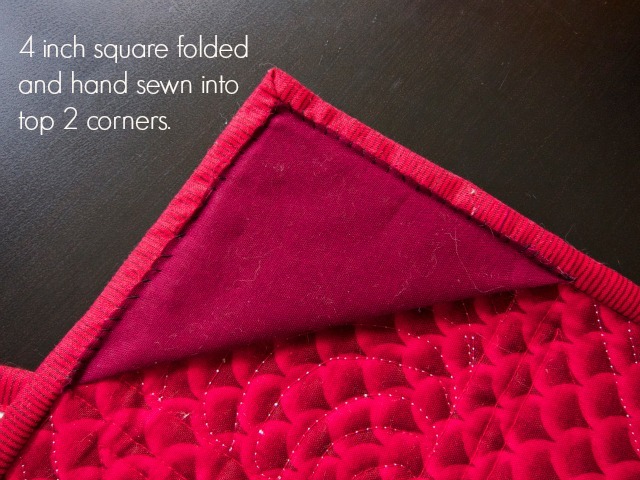 Once again, Karen at Sew Many Ways had the answer in her Blogging Tips section. I am getting a bit more comfortable with HTML and by that I mean I don't run screaming out of the room the moment I see it. That's progress. Anyway, I created some wonderful new mint colored social media buttons following Karen's step by step instructions. If I can do it, so can you! The only problem for me - there wasn't a button for Feedly. With Google Reader going away in a week it seems like most people are switching over to either Feedly or Bloglovin'. 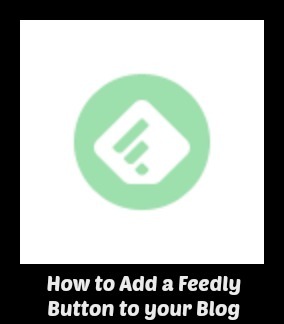 I personally prefer Bloglovin' but wanted to give my readers who prefer Feedly a quick option to subscribe. That's why I created one! 3. To create the logo I used Pixlr Editor. I needed to create an account but it was free. Go to http://pixlr.com/editor/ and select "Open Image from Computer" and open up both .png files that are in red in steps 1 and 2. 4. Click onto the Feedly file to make it the active picture. Click EDIT and SELECT ALL from the drop down menu. Then click EDIT and COPY. 5. Now click on the colored button file to make it the active picture. Click EDIT and PASTE. And would you look at that - you now have a button to perfectly match all of your other buttons! 6. Now click FILE and SAVE. Be sure to change the name from Blank to Feedly and you're done! Now you can continue with Karen's wonderful tutorial on how to create the HTML file. Hopefully this has helped! I guess this could be considered my very first tutorial! Added Note: If anyone tries my steps, please let me know if it worked for you or if I'm missing anything. Thanks! We're getting ready to put our house up for sale in the next few weeks and have been getting everything in order. We've had a small desk in our spare bedroom that could be used for my sewing machine or as a second desk space when needed. Our realtor recommended that we either make it a bedroom or an office, not both. So, we put the queen sized bed into storage and made it into an office/sewing room. The desk that was already in the room was designated for my sewing machine and we moved my husband's desk up there as well to make our family room look bigger. 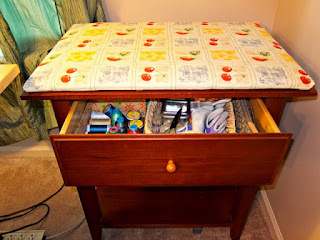 I decided to keep the nightstand in the room and use it to keep some of my sewing supplies in it - thread, trimming scissors, my quilting gloves, rotary cutter, etc. With the new arrangement I quickly realized that I needed a better system for pressing blocks during piecing. My ironing board on the other side of my sewing table and I felt like I spent most of my time jumping up to press a seam. After a quick trip to Home Depot, I had me a perfect sized piece of plywood that I covered with some extra batting and a scrap piece of upholstery fabric. Viola! 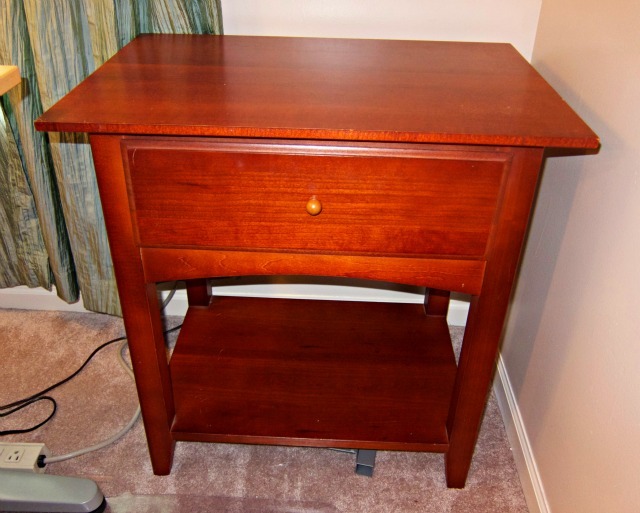 A cheery little pressing board to give our old nightstand a new purpose. It worked out beautifully. Weekly link-ups: I'm linking this post up to the Plum and June's Let's Get Acquainted Link Up which is being hosted this week at Heart of Charnwood. 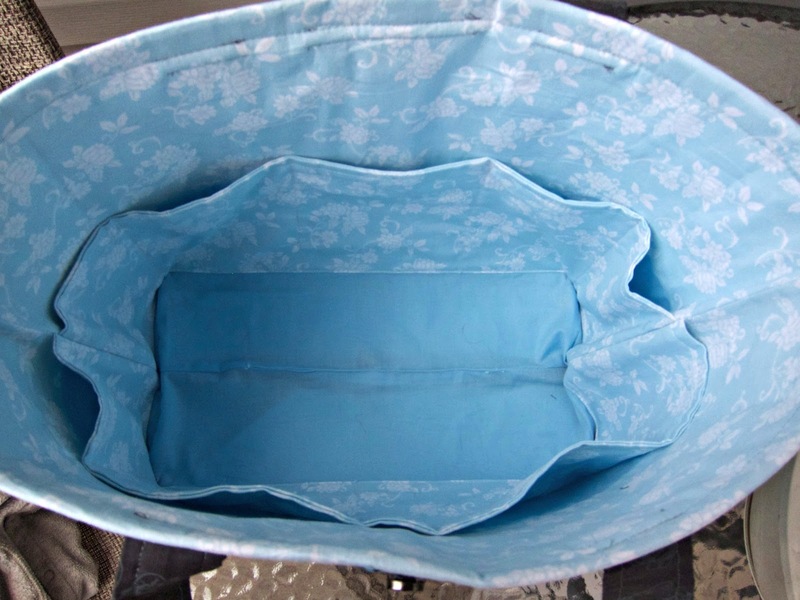 I keep a small waste basket under my sewing table but I always seem to be trimming off threads while at my ironing board (which isn't next to my sewing table right now). So, what's a girl to do? 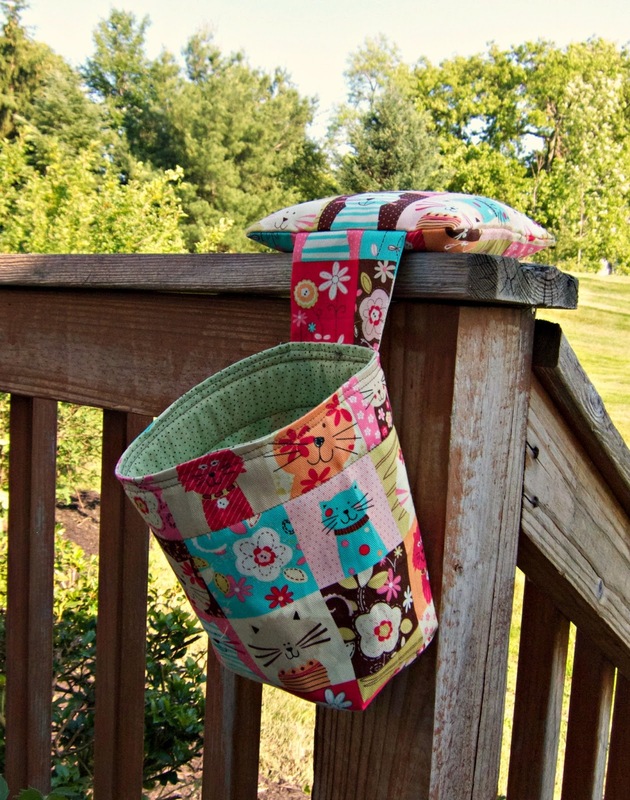 Make a cute thread catcher with some adorable novelty cat fabric, of course! 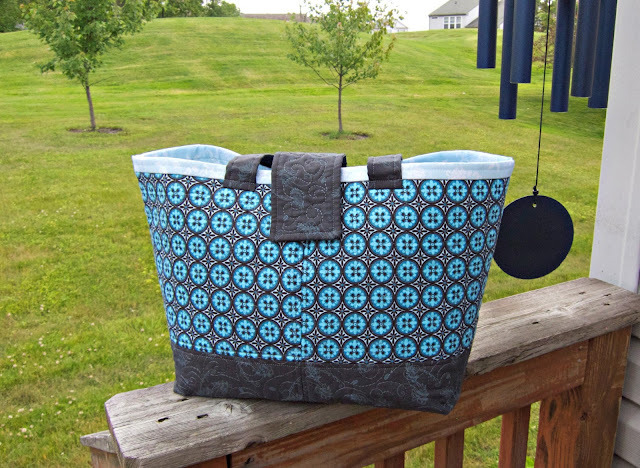 I'd seen various thread catchers for sale on Etsy but I knew I could make one and found this tutorial at the Polka Dot Apron. It comes together very quickly - less than 2 hours total. Time well spent to brighten up my sewing room! I'm still pretty new at navigating the waters of keeping a blog on Blogger, having switched over from my old blog back in May. Once I got everything up and running I decided to combine my blogger profile with Google+ and that's where my unknown troubles began. 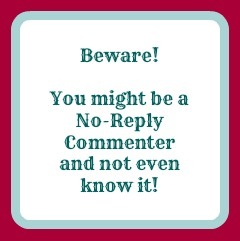 I'd heard about people being "No Reply Bloggers" but I didn't think I fell into that category. Little did I know! Thanks to Beth over at Plum and June - she already had my contact information and was so kind to contact me letting me know that I was one of those no-reply bloggers! Thankfully a solution to my problem was only a few clicks away, once I knew what to do. I tried researching my issue through Blogger Help and Google+ but nothing seemed to address it. After doing a more extensive internet search I came across this wonderful post from Robin at Fluster Buster. It was so helpful and now my comments are no longer a dead-end! Hopefully this can help someone else too! 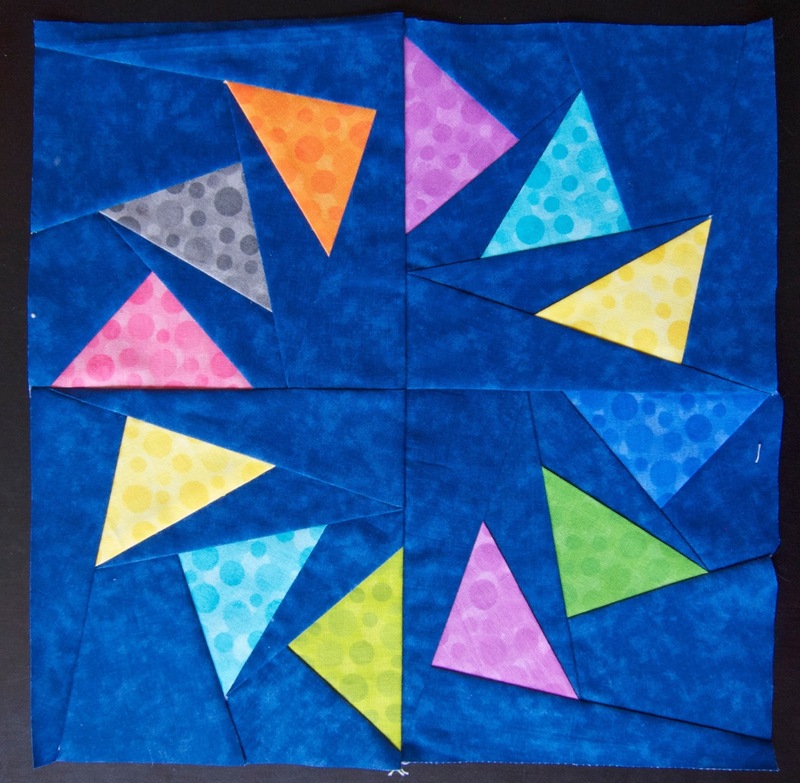 I took two 4-inch squares, folded them into triangles and hand stitched them on the back side of the quilt in the top two corners. 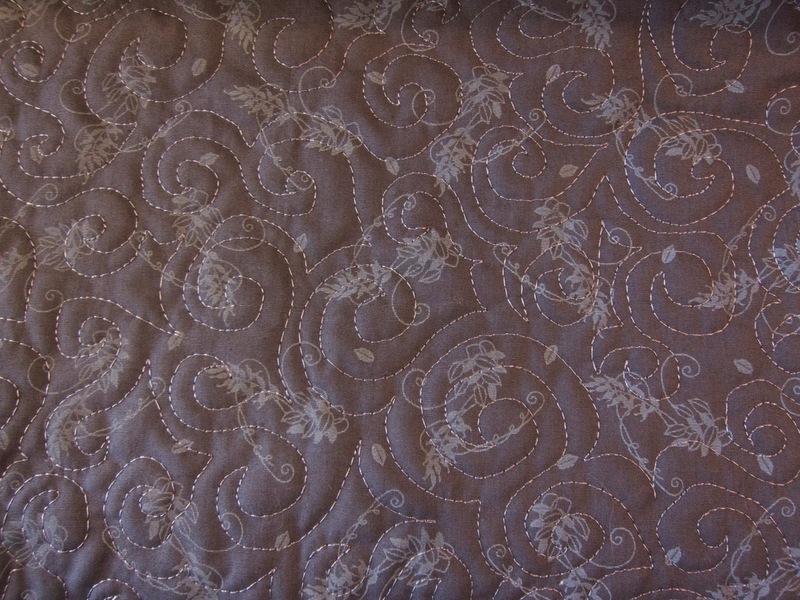 I then measured the back of my quilt from the inside edge of the bindings. For this quilt it was 31.5 inches. I went to my local Home Depot and in their crown moulding section they have 1/4" x 1-3/8" pine lattice for 67 cents a foot that you can cut yourself. You could just buy a yard stick and cut it down, but this was probably cheaper. 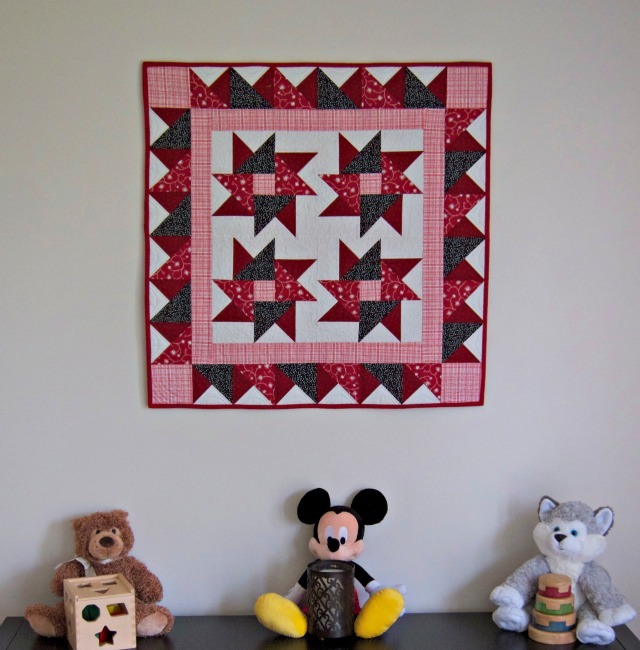 For smaller wall hanging quilts you could even use a paint stick. Once you have your stick cut to the correct measurement, it should just slide right into the little pockets you added. 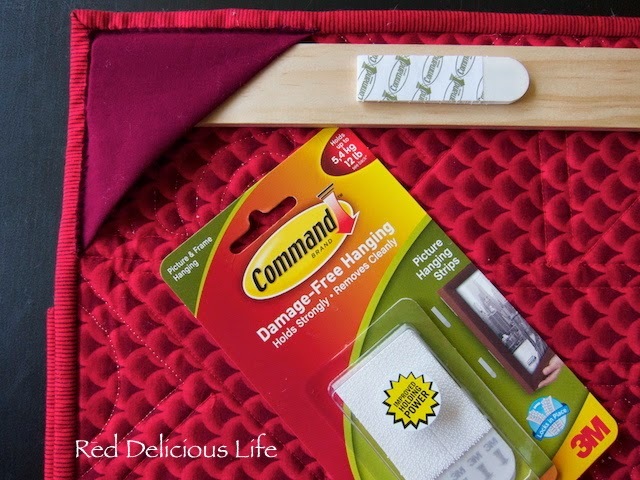 Lastly, you stick on the 3M Command Strips. I used 2, about an inch in from each of the pockets. 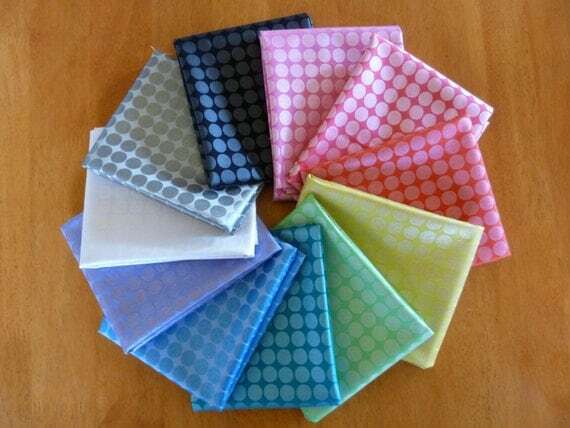 Peel off the strips and stick it up on the wall where you like and voila! 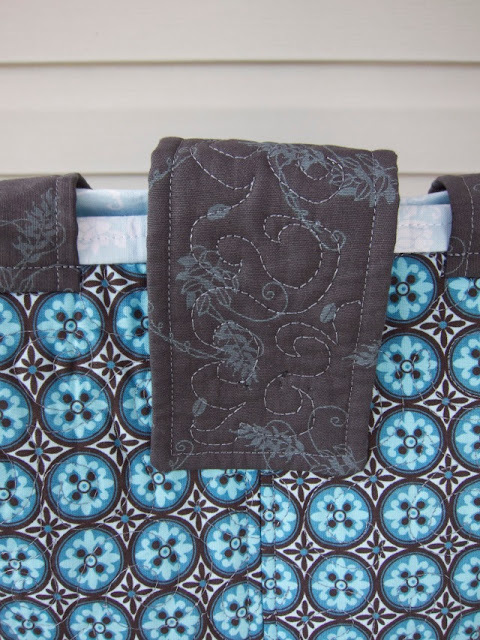 A super easy, clever way to hang a smaller quilt. If you know you plan on hanging a small quilt you can baste on the triangle pockets before you sew on your binding. Hooray for Friday! 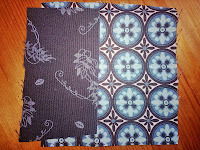 And an even bigger hooray for a fabric giveaway that Maureen is having on her blog Maureen Cracknell Homemade! Isn't this cutest fabric you've ever seen?! Go and check out Maureen's blog for all the details including a 15% discount at Knotted Thread's Etsy page! Hello and Happy Free-Motion Friday! 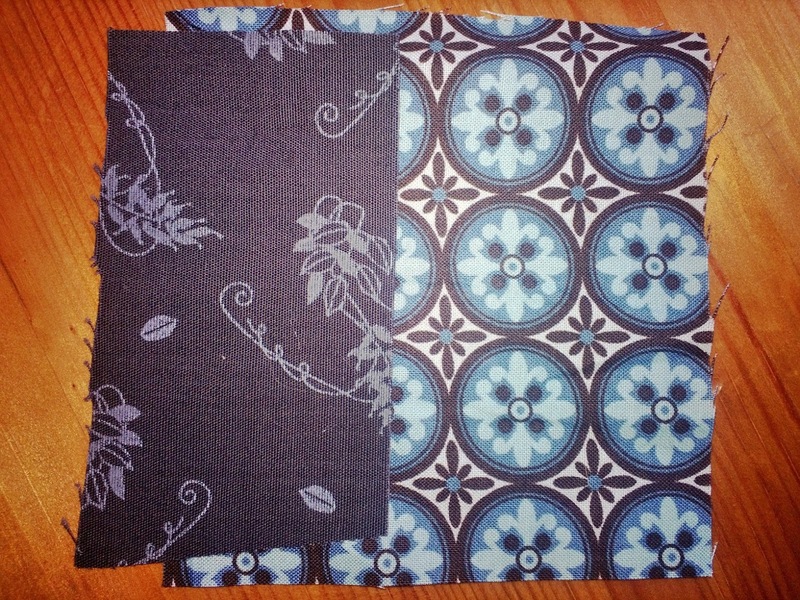 I solved my earlier quilt design dilemma, and quite successfully if I say so myself. I decided to do a swirl design and I couldn't be happier with how it turned out. I also did the same design on the blue medallion fabric but it was much more difficult since I couldn't see my stitches on the busier pattern. I tried flipping the sandwich over and quilting directly on top of the batting but that had its own challenges. I could see better but my hopper foot kept catching little fibers. I also didn't think the stitches looked as smooth or flat on the fabric side. Ultimately I ended up flipping it back to the fabric side and used my closed darning foot. I originally thought that it might be another Christmas gift in the making but I just might have to keep this one for myself! I finished the bag last night so I'll post pictures soon. 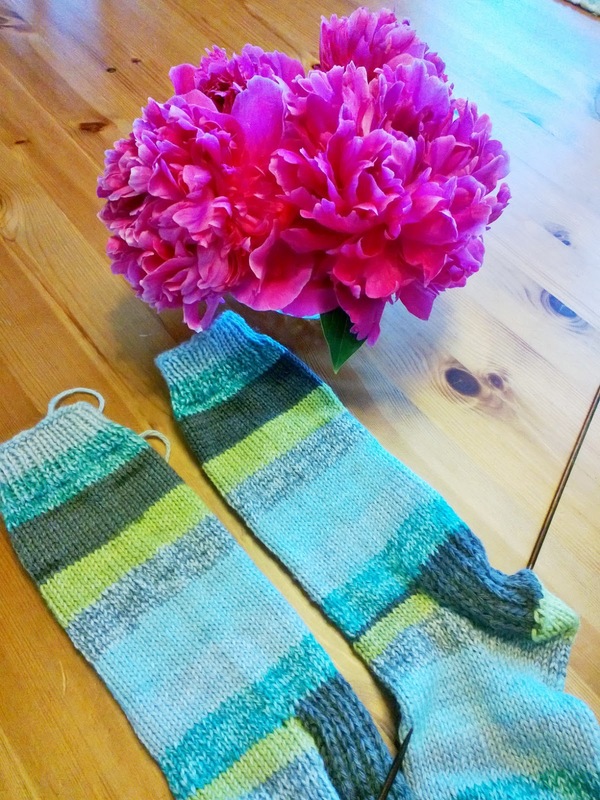 A few weeks ago I posted about the random stripe in my sock that was bothering me and whether or not I should make the second sock like the first, or rip back the first sock and remove the offending stripe. The OCD in me just didn't allow me to just let it go so you can see that there isn't a dark stripe in the second sock. Eventually I'll get around to ripping back the first sock and fixing it. Just as an fyi, I'm not usually this slow of a knitter - these are my Cedar Point socks. It's the project that I work on in the car when we're driving to Sandusky. It makes the 50 minute drive go by faster. Knitwear looks so much better when paired with peonies!